Where is E85 available in TN? Thorntons, Twice Daily, Speedway, Pilot & other stations. 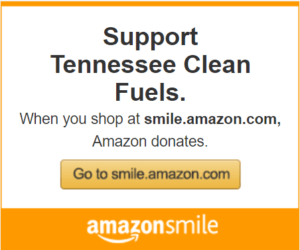 See the TN E85 station map at the bottom of this page! Where can I find a list of flexible fuel vehicles, or FFVs, that are available to purchase? The Renewable Fuels Association (RFA) maintains a list of FFVs that shows the OEMs/auto brands FFV offerings from 2018 all the way back to in the 1990’s! That means you can shop for used FFVs, too. Different blends used by Tennessee fleets E10 and E85. E85 is 51-83% ethanol blended with gasoline, and is now called simply “flex fuel.” E10 is now the fuel you find at almost every convenience store you see from coast to coast. Also, now growing in sales across the US, are E15 and what are called “Mid-level blends” that include E30 and E40, although those are not widely available yet in Tennessee. Best resource for learning about ethanol www.ethanolrfa.org.The Renewable Fuels Association has numerous resources for consumers on their site, including “How is ethanol made?,” “Why is ethanol important? and “Ethanol blends and how they effect my engine.” They also have resources for retailers that include Handling & Conversion information, Technical Reference publications, and documents related to the business proposition of selling higher ethanol blends. Ethanol is a cleaner-burning alternative fuel produced from domestic renewable resources such as corn and other starch-containing plant materials known as biomass. It can also be made from cellulosic materials such as switchgrass and crop residues. In the United States, ethanol is primarily produced from the starch in corn grain. Recent studies using updated data about corn production methods demonstrate a positive energy balance for corn ethanol, meaning that fuel production does not require more energy than the amount of energy contained in the fuel. Ethanol is mixed with gasoline by the blender/fuel supplier to make E10, E15 or E85, and distributed to fueling stations. More than 95% of U.S. gasoline contains ethanol, typically E10 (10% ethanol, 90% gasoline), to oxygenate the fuel and reduce air pollution. Ethanol is also available as E85 (a gasoline-ethanol blend containing 51% to 83% ethanol, depending on geography and season). This fuel can be used in flexible fuel vehicles, which can run on high-level ethanol blends, gasoline, or any blend of these. What are the benefits of ethanol? According to the Department of Energy’s Argonne National Laboratory, ethanol reduces greenhouse gas emissions by an average of 34 percent in comparison to gasoline. Moreover, advanced biofuels have the potential to reduce greenhouse gas emissions by over 100 percent. Ethanol from any source has a positive net energy balance — meaning it gives more energy than is needed to produce it. In 2014, the 13.4 billion gallons of ethanol blended into gasoline in the United States helped reduce greenhouse gas emissions from on-road vehicles by approximately 38 million metric tons, which is the equivalent of removing roughly 8 million automobiles from the road. Imagine if we were using more ethanol in our motor fuels. Ethanol is already replacing millions of barrels of imported petroleum. That’s petroleum that could have ended up in our environment, devastating coastal industries, ecosystems and communities. Ethanol is clean burning, renewable, and it’s grown right here in America. The EPA estimates that higher Renewable Fuel Standards will reduce Greenhouse Gas Emissions from transportation by a total of 6.8 billion tons CO2 equivalent when measured over a 100-year timeframe. This is the equivalent of approximately 160 million tons CO2 equivalent per year. The overall reductions would be like removing 24 million vehicles from the road. What are the emissions reductions gained from ethanol? The carbon dioxide released when ethanol is burned is balanced by the carbon dioxide captured when the crops are grown to make ethanol. This differs from petroleum, which is made from plants that grew millions of years ago. On a life cycle analysis basis, corn-based ethanol production and use reduces greenhouse gas emissions (GHGs) by up to 52% compared to gasoline production and use. Cellulosic ethanol use could reduce GHGs by as much as 86%. Learn how fleets across the country are turning to renewable biofuels for cleaner transportation. Ethanol Basics, from the AFDC Website — A great starting point for learning about ethanol opportunities and technologies. The American Coalition For Ethanol — A handy place to get involved and stay current on ethanol news. Growth Energy — The nation’s premier trade association working to expand consumer access to ethanol-majority fuels. Renewable Fuels Association – The RFA advocates for the ethanol industry and provides data and analysis to its members and the public. E85Prices.com — An indispensable resource dedicated to tracking the price of E85 fuel nationwide. Commonwealth Agri Energy and The Andersons, Inc. — Two American producers of ethanol products. Fuel Freedom Foundation — An organization dedicated to reducing driving costs for your existing vehicle by supporting cheaper fuel choices. American Coalition for Ethanol — An organization dedicated to uniting agricultural producers, businesses, and individuals in support of ethanol. Ethanol Across America — An organization committed to advancing use of renewable fuels that can reduce oil imports and stimulate the economy.